The fresh engineers are invited for Job Oriented EPC based Renewable energy(Solar) certification training program for B.Tech / B.E/ Diploma / ITI from all engineering branches of Electronics / Electrical / Instrumentation/Communication & Control / Mechanical, that is awarded on the latest & smart technologies, tools, device, equipments & software on live projects to bring the fresh trainee on corporate platform. This course cover the PV cell & panel, Inverter, Chargers, Batteries, Switchgears, Transformer, Protection relays, Cables & Wire, SCADA (Supervisory Control and Data Acquisition) & HMI (Human Machine Interface), PLC (Programmable Logic Controller), DCS (Data Concentrator System), Event Logger, RTU (Remote Terminal Unit), Instrument & transducers, Energy Meters, panel designing, Industrial networking, Relay, Contactors and philosophy & system architecture design with ON grid/OFF Grid connectivity. We are providing the platform for fresher to provide job in core industries. We also offer 6 months/weeks Industrial Internship at our latest technology & equipped training centers. 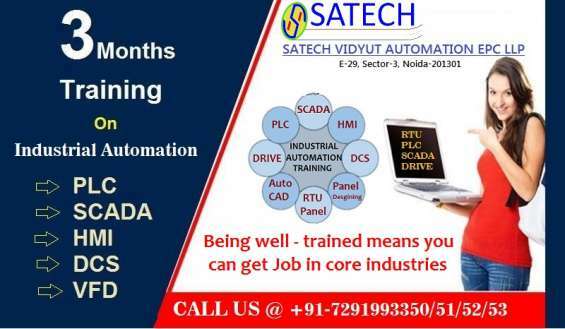 SATECH VIDYUT is pioneer in the latest Technology based EPC Training Programs to corporate & institutional level in the segments of Industrial automation, Substation Automation, Electrical design engineering & renewable energy (Solar) to bridge the gap of skilled resource in the domain industries. With this company also deals in EPC projects, Services & Trading. We ensure fresher trained trainees for Training & Placement in right field or domain or industries in the different regions, area, zones and locations at PAN INDIA level. We facilitate dynamic engineers for job opportunity with our overseas customers or partner companies.